On Wednesday's edition of The Five on Fox News, Juan Williams passed off Peter Fonda's overtly threatening tweet wishing that 12-year-old Barron Trump should "be put in a cage with pedophiles" as "poorly worded." He also claimed that his fellow hosts were "taking delight" in the appearance of Fonda's series of threats, because talking about them "takes away from the conversation focusing on what President Trump did." Expressed a desire to see "lying g---" Homeland Security chief Kristjen Nielsen "put in a cage and poked at by passersby ... naked and whipped by passersby." Wished that Sarah Sanders (also "a lying g---") would have her children taken away and be "deported to Arkansas." (originally tweeted in all caps) That protesters should "surround" the homes of ICE agents, "find out where their children go" to school and "surround their schools in protest," because "we need to make their children worry now." Fonda's "apology" acknowledged that his tirade was "inappropriate and vulgar," but did not admit that he had effectively advocated violence. He also did not include apologies to Nielsen or Sanders. 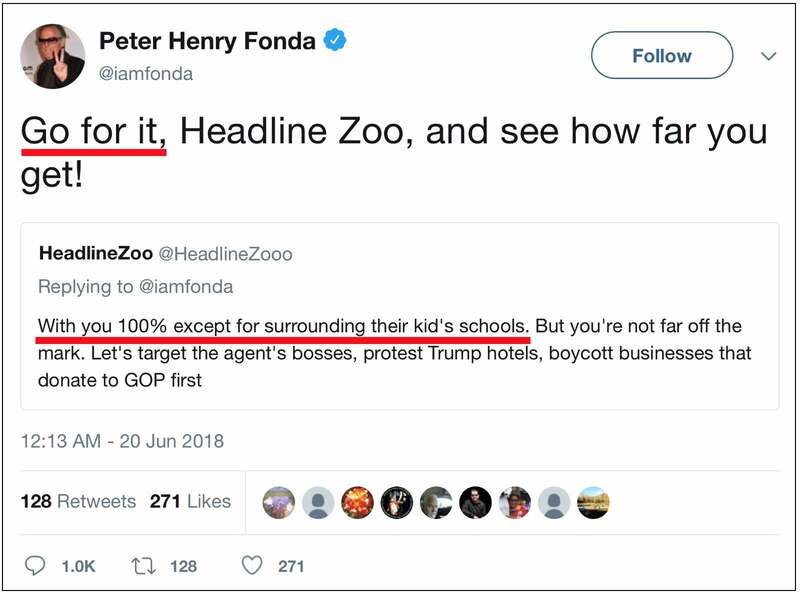 Almost as if falling in line to minimize the damage, Leanne Italie's Associated Press story on Fonda's tweets began by telling the world he had "apologized," mentioned that he had "suggested" harassing ICE agents and their children — sorry AP, he did more than "suggest"; he advocated those actions — and failed to mention his tweets advocating actions against Nielsen and Sanders. Greg Gutfeld's introduction in the full segment reminded viewers, as I reminded readers earlier this week, that the Obama administration was found to have released unaccompanied illegal-immigrant children to human traffickers in 2014 — a result which was specifically enabled by the administration's relaxation and elimination of important steps in the vetting process. GREG GUTFELD: Juan, I'm not even going to ask you to defend this. I know you find it disgusting. JUAN WILLIAMS: No, I mean to me, it was a poorly worded tweet, offensive language used. KATIE PAVLICH: Delight in it? UNIDENTIFIED HOST: And that justifies it. WILLIAMS: — not knowing where his or her parents are, and you say, "oh well that's not the issue." The issue (to you) is some Hollywood celebrity acting like a fool. What's the foolishness is that people are saying the President did something here — Republicans, Democrats, independents — that is just abhorrent to who we are as a people. GUTFELD: And that justifies this behavior. Got it, got it. WILLIAMS: No I didn't say it justifies it. GUTFELD: You're definitely defending it. You're defending it! WILLIAMS: No, what I said is that you're delighting in it because it gives you an opportunity to change the conversation. Williams apparently believes that Fonda's threatening tirade directed at a child, two government officials doing their jobs, and thousands of immigration enforcement officials, shouldn't even have been a discussion topic, and that we should dismiss it as a meaningless, childish temper tantrum. The evidence — after three years of violent and threatening statements and actions by celebrities and scores of others who should know better, which in recent days have ramped up significantly to include a real threat and media-encouraged real harassment — says otherwise.